Not only is ant control a mainstay service for most pest control companies, but it is increasing for a majority of companies across the country.1 Syngenta offers two proven gel bait solutions for effective ant control, so pest management professionals can choose what best fits their business needs. Powered by a MetaActive™ compound, which attacks insects’ nervous systems to result in paralysis and death, Advion® Ant gel bait is the leading ant gel bait in the market. It features a formulation that reflects the changing feeding preferences of different ants, from sweet foods to proteins to oils. Optigard® Ant gel bait controls ant workers, brood and queens to ensure full colony elimination with an attractive, sugar-based gel matrix. Some gel baits can be too gooey, which makes it more difficult for ants to transport to the colony. However, Optigard Ant contains a clear gel formulation with a consistency that makes it easy for ants to consume and carry back to the colony to share with nest mates. 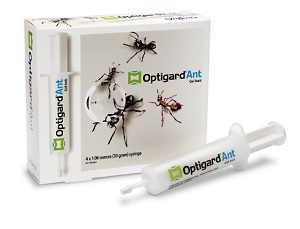 Get your preferred solution for an ant-free environment with Advion Ant and Optigard Ant. For more information, please contact your local Syngenta sales representative or download the ANTSwers informational brochure. ©2018 Syngenta. Important: Always read and follow label instructions. Some products may not be registered for sale or use in all states or counties and/or may have state-specific use requirements. Please check with your local extension service to ensure registration and proper use. Advion®, For Life Uninterrupted™, Optigard® and the Syngenta logo are trademarks of a Syngenta Group Company. Syngenta Customer Center: 1-866-SYNGENT(A) (796-4368).